Over the last 10 years, many sustainable improvements have been accomplished related to packaging and product design. This year at Walmart’s 2014 Sustainable Product Expo, eight of the largest food companies announced pledges to help ensure that tomorrow’s food supply is affordable and sustainable for the nine billion people projected to inhabit the planet by 2050. Executives from these leading CPG companies gathered in Bentonville in partnership with Walmart to help preserve the environment in the years ahead. Together, the participating suppliers represent more than $100 billion in sales at Walmart. 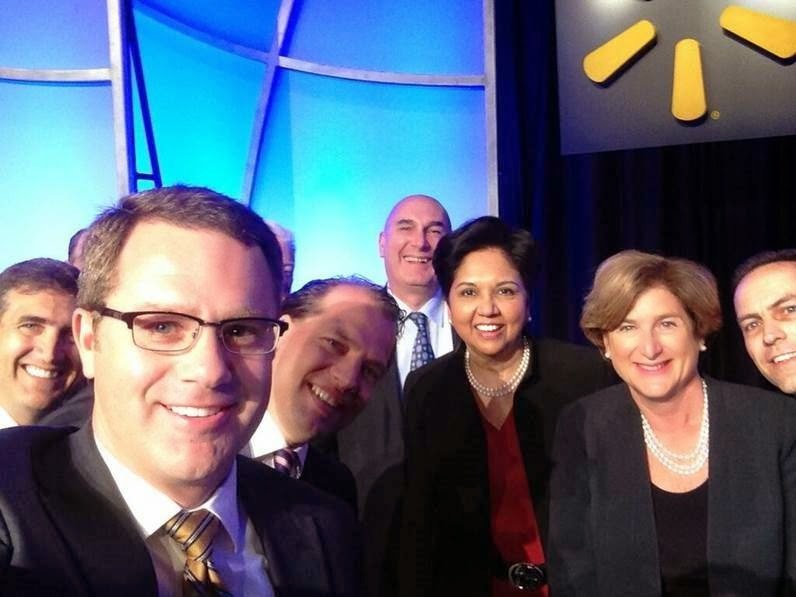 We are all smiles today with a #CEOselfie at the #WalmartExpo! “A great deal of innovative work is happening every day, but there are still too many gaps and missed opportunities. Today’s commitments are about creating real systems change from one end of the supply chain to the other — meaning how products are grown and made, how they’re transported and sold, and how we touch the lives of people along the way.” stated Doug McMillon, President and Chief Executive Officer of Walmart Stores, Inc.
At the expo and on the exhibitor show floor, two main areas that were evident to align with McMillon’s synopsis included Walmart’s ‘Made in America’ initiative that launched in 2013 and CPG companies continued interest in designing sustainable packaging for the supply chain. “96 percent of Walmart shoppers indicated they have purchased sustainable products in the past year” according to a recent survey conducted by Walmart’s Global Customer Insights and Analytics group. The Expo highlighted several initiatives to further expand access to sustainable products and create more transparency in the supply chain. If you think about all the energy and effort that goes into making the products people use everyday, not just the package itself, but all the components in the supply chain beginning with sourcing, manufacturing, packaging, distribution, product use, and disposal — there are several innovation opportunities that can lead to improved packaging supply chain performance and sustainable cost savings. These innovation themes combined with Walmart’s ‘Made in America’ initiative will require retailers, product manufacturers, packaging suppliers, and supply chain partners to double down on their efforts to make a bigger difference as Walmart looks to reshore $50 Billion in goods over the next 10 years. Companies that can optimize their packaging and supply chain will be best positioned to take advantage of the movement towards "Near Shoring". Sustainability is no longer an after-thought and gaining priority for major companies across industries. What is your company doing to evolve sustainability throughout the supply chain?